Actually, the Super Bowl may be the one event where these kinds of prices are palatable; it's not like many John Q. Fans are going to this game. 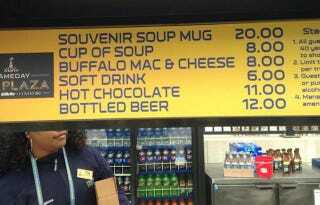 Still, even for the aristocrats and hangers on, a $20 souvenir cup of soup is tough to stomach. (You could've at least least called it a Souper Bowl, guys.) Maybe it'd be worth it if that cup regenerates more soup after you've finished it. Maybe. You know things are bad when you find yourself thinking hmm, six bucks for a soda? Not bad. Now imagine stuffing six singles into a vending machine.